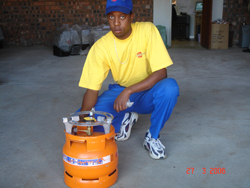 Underneath is a picture of standard Gas Cooker or SESHA as it is called in South Africa. The authorities have specified towards the concessionaires that in addition to provide Solar PV systems to households, they also have to provide better solutions for rural cooking. Thereby the remote village inhabitants can start a transition from their dependency on fossil fuels like coal, wood and kerosene and in the interim use LPG as a better solution although it also is a fossil fuel. Many environmental organisations accept this as a transitional solution towards a future non-fossil solution for example biomass. All over the world people have trialed many different solutions. None have surfaced as a winner because of very sensitive socio factors like cooking after sunset when a family first knows if they can afford to but food if a solar cooker is the suggested solution. Then there is the question of using firewood and deforestation. And finally very many solutions are better suited for community cooking while the need is at an individual household level. Gas based cooking seems to be socially and economically acceptable. It also contributes towards better health and reduces fire hazards. 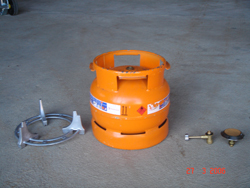 A SESHA can be bought with one 5 kg LPG included. Users can afford a refill when needed at a cost that is similar to what they already use for other solutions. A household in the same way as for a SHS cannot afford to buy a SESHA. So if you wish to help out in this area too, then you can adopt a household by donating towards a SESHA. This is a smaller amount than to donate towards a SHS.